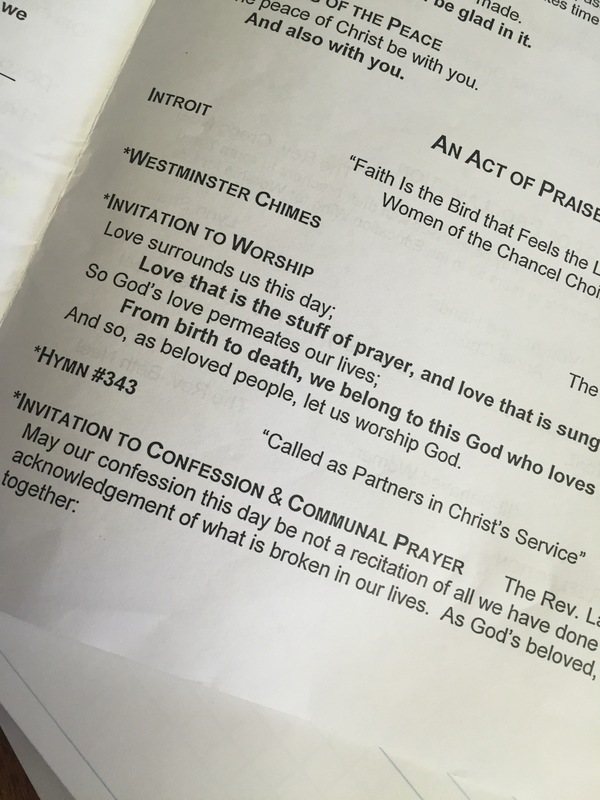 A few Sundays ago, as the deacons brought the offering up to the table and the congregation sang the Old 100th doxology, I found myself doing what I always do when singing that doxology: changing the words to make the God-language more inclusive. It’s just a thing I do, week after week, my little stab at feminism in the midst of a tradition that is slowly, but perceptibly, moving away from patriarchy. And then I felt like David when Nathan said to him, “You are the man.” Not in the “you da man” way, but in the “you yourself do what you’ve been critiquing others for doing” way. It all started with the Apostles’ Creed. We got some feedback on that, so we changed the intro. “Let us join in the historic tradition of the church, saying together the Apostle’s Creed, which the church has said in baptism for thousands of years.” Feedback on that too, but it’s still in. There are some people who don’t like to pass the peace, or to say “the peace of Christ be with you.” There are some who don’t like opening the service with the words “This is the day the Lord has made; let us rejoice and be glad in it.” There are some who wish we didn’t do Moments with Children, and likely more than a few who wish there were no sermon, or a more intellectual sermon, or a less intellectual sermon. Some don’t like the prayers of the people. You get the picture. What’s a poor pastor to do? First, I am grateful that people in our pews take theology seriously, and want to be authentic about what they say they believe. We have a broad array of theological beliefs in the congregation, and I would have it no other way, because it enriches our conversation and our life together. Second, there is room for all of us. If I choose to sing different words to the doxology, why can’t someone else stand but not say the Apostles’ Creed? Why can’t someone who is new to Christianity say “Good morning” and in time, may learn to say “The peace of Christ be with you”? Third, we’re keeping the tricky bits in. Sure, we could take out “This is the day the Lord has made”, and the passing of the peace, and the children’s time, and the sermon, and the prayers, and the creeds, and a lot of people would be happy. A lot of people would be unhappy. A lot of people would be comfortable that we don’t have complex things, or blatantly faithful things, in the service, but without those things, worship would be pretty watered down and if I went to a worship service that didn’t challenge me, or even make me mad or questioning just a little bit, then I might as well go to Starbucks, drink a latte, and read the Sunday New York Times. Which a lot of people do. But not those who show up Sunday after Sunday to sit in our pews, to sing, to pray, to get bothered, to be comforted, to be told they are loved, with all their questions and opinions and preferences. They are loved, and so am I. But about that “Ghost” part…. This morning I was sitting in the sanctuary about half an hour before the service started. I came down from the office because the choir was rehearsing one of my favorite anthems – John Rutter’s For the Beauty of the Earth – and hearing just once in the service wasn’t going to cut if for me. I sat down in one of the transept pews, next to a dear, long-time member of the church who comes early, I think, so she can hear the choir rehearse. As the choir was making their way through the song, one of my other pastor colleagues came in with a family whose infant son was to be baptized. The parents joined the church at Easter, when the dad was baptized, so there was something lovely about he and his wife bringing their baby to be baptized. The child was as bald as a peeled peach, with a sweet sweet round face. Just enough drool to make him adorable hung on his chin, and he smiled at me while I made silly faces at him. My colleague was showing the parents the baptism choreography, and as he took the baby, so tenderly, and kissed his little forehead, the choir was singing, “For the joy of human love/Brother, sister, parent child,” I thought: that’s perfect. Everyone is up there practicing for the real thing, and the community isn’t gathered yet to witness it, but I was able to witness this moment when song and delight and love came together just right. That would have been enough for me, that experience of the holy, twenty minutes before the service started. But the choir finished and need to trot downstairs to put their robes on, and the family need to do one last diaper change before the service. I had gone to the trouble to write a sermon, so I figured I might as well preach. Those perfect moments are rare, especially when you’re in the business of church and you have a fair amount of responsibility for all the details that go into that one hour a week. Rarely do we conduct perfect worship, nor does God want perfection. I think God would much rather have something flawed and authentic than perfect and over-rehearsed. But those rare perfect moments are like little asterisks at the end of the sentence of a hard week, a reminder that the crap gets meliorated by a gracious, patient God who isn’t too high and mighty to show up for rehearsals. It was good worship today – not perfect, but good – and as one parishioner noted, it thundered during the baptism, which was cool of the Holy Spirit. It’s so good in the fall to have everyone back together, the fullness of worship and hymns and prayers and rambunctious kids in the children’s moment and all that. But truth be told, when the service started, I had already done my worship for the day.